Tarps Direct's 10 ounce Vinyl Coated Polyester tarps are 14 mil thick. 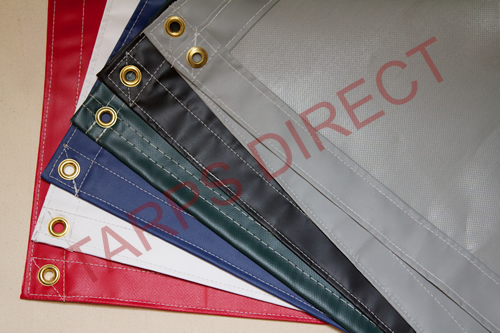 They are a very strong, waterproof tarp featuring a UV treated fabric which is used in many industrial applications. Good for dump trucks, trailers, protecting equipment and agriculture applications as well as any other use that requires a lightweight but strong cover. Please call if you need a size that is not listed. Normally ships within 7-10 days. Please note vinyl tarps are listed as a cut size – finish size is 6" or 3%-5% smaller. Common uses - dump trucks, trailers, equipment, athletic fields, canopies, tents, frame construction, 5-sided covers, industrial and any application that needs a great cover.